A sample of the new heat-conducting plastic. Image credit: Joseph Xu, Michigan Engineering. Advanced plastics could usher in lighter, cheaper, more energy-efficient product components, including those used in vehicles, LEDs and computers – if only the plastics were better at dissipating heat. A new technique that can change plastic's molecular structure to help it cast off heat represents a promising step in that direction. Developed by a team of material scientists and mechanical engineers at the University of Michigan and detailed in a new paper in Science Advances, the process is inexpensive and scalable, and can likely be adapted to a variety of other plastics. 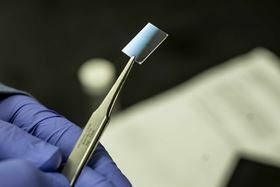 In preliminary tests, it made a polymer about as thermally conductive as glass – still far less than metals or ceramics, but six times better at dissipating heat than the same polymer without the treatment. "Plastics are replacing metals and ceramics in many places, but they're such poor heat conductors that nobody even considers them for applications that require heat to be dissipated efficiently," said Jinsang Kim, U-M materials science and engineering professor. "We're working to change that by applying thermal engineering to plastics in a way that hasn't been done before." The process is a major departure from previous approaches, which have focused on adding metallic or ceramic fillers to plastics. This has met with limited success: a large amount of filler must be added, which is expensive and can change the properties of the plastic in undesirable ways. Instead, the new technique uses a process that engineers the structure of the material itself. Plastics are made of long chains of molecules that are tightly coiled and tangled like a bowl of spaghetti. As heat travels through the material, it must travel along and between these chains – an arduous, roundabout journey that impedes its progress. The team – which also includes U-M associate professor of mechanical engineering Kevin Pipe, mechanical engineering graduate researcher Chen Li and materials science and engineering graduate student Apoorv Shanker – used a chemical process to expand and straighten the molecular chains, thereby providing the heat energy with a more direct route through the plastic. To accomplish this, they dissolved the plastic in water, then added electrolytes to the solution to raise its pH, making it alkaline. This caused the individual links in the polymer chain – called monomers – to take on a negative charge, leading them to repel each other. As the monomers move apart, they unfurl the chain's tight coils. Finally, the water and polymer solution is sprayed onto plates using a common industrial process known as spin casting, which reconstitutes the solution into a solid plastic film. The uncoiled molecular chains now make it easier for heat to travel through the plastic. The team also found that the process has a secondary benefit – it stiffens the polymer chains and helps them pack together more tightly, making them even more thermally conductive. "Polymer molecules conduct heat by vibrating, and a stiffer molecule chain can vibrate more easily," Shanker said. "Think of a tightly stretched guitar string compared to a loosely coiled piece of twine. The guitar string will vibrate when plucked, the twine won't. Polymer molecule chains behave in a similar way." Pipe says the work could have important consequences because of the large number of polymer applications in which temperature is important. "Researchers have long studied ways to modify the molecular structure of polymers to engineer their mechanical, optical or electronic properties, but very few studies have examined molecular design approaches to engineer their thermal properties," Pipe said. "While heat flow in materials is often a complex process, even small improvements in the thermal conductivities of polymers can have a large technological impact." The team is now looking at making composites that combine the new technique with several other heat dissipating strategies to further increase thermal conductivity. They're also working to apply the concept to other types of polymers beyond those used in this research. A commercial product is likely several years away. "We're looking at using organic solvents to apply this technique to non-water soluble polymers," Li said. "But we believe that the concept of using electrolytes to thermally engineer polymers is a versatile idea that will apply across many other materials."